Thanks for joining me! Tell your friends and colleagues to sign up here, and send tips and feedback to lawler@axios.com. Venezuelan President Nicolas Maduro has a new six-year term after declaring victory in a sham election over the weekend. 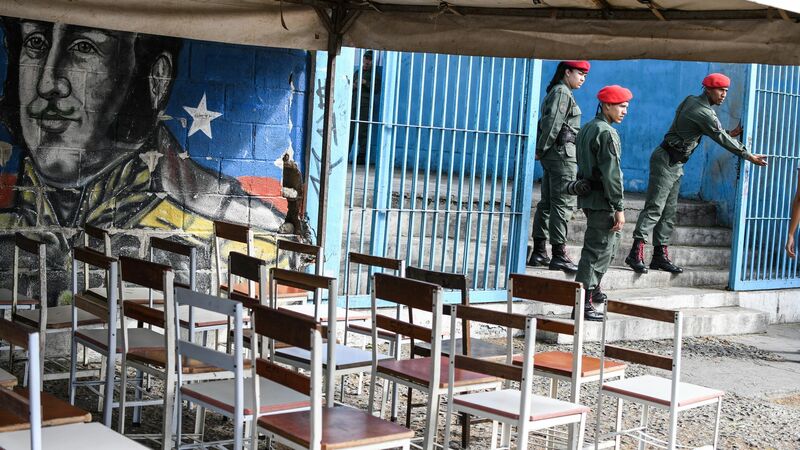 Between the lines: Turnout plummeted to 46% from about 80% in previous elections despite the fact that Maduro offered cash and boxes of food to those who cast ballots. That's remarkable in a country struggling through one of the world's worst economic crises. "We're focused on our elections. We don't get to dictate how other countries operate. Putin has been elected in their country, and that's not something we can dictate to them, how they operate." "Venezuela’s election was a sham. America stands AGAINST dictatorship and WITH the people of Venezuela calling for free and fair elections." Secretary of State Mike Pompeo today laid out what he called "the path forward" after President Trump's decision to withdraw the U.S. from the Iran nuclear deal. He threatened the "strongest sanctions in history" unless Iran complies with 12 U.S. prerequisites for a new deal. The Atlantic Council's Barbara Slavin writes for Axios Expert Voices that Pompeo's strategy "has almost no chance of working." "Pompeo's demands range from Iran ending all uranium enrichment ... to stopping support for Hezbollah, Hamas and Iran’s other historic partners in the Middle East. He also demanded that Iran withdraw 'all forces under Iranian command' from Syria." "The demands would require that the Iranian leopard not just change its spots but transform itself into a lamb, subordinated to the wishes of the U.S. and Iran's regional rivals — Saudi Arabia, the United Arab Emirates and Israel." The bottom line: "It's likely to further alienate the U.S.'s European allies, boost China as a global economic and political power and gladden Iranian hardliners looking for more reason to restart proscribed nuclear activities and to continue their interventions in the Middle East." Treasury Secretary Steve Mnuchin announced yesterday that the "trade war is on hold," and around $150 billion in expected tariffs are off the table for now, Axios' Dan Primack writes. That follows a joint-statement from the two countries on Saturday, which said China would purchase more U.S. goods and take in more U.S. agriculture and energy exports. The Washington Post notes that the lack of specifics on trade deficit reduction and on IP protections for U.S. companies are wins for China. Between the lines, from Axios' Jonathan Swan: Sources who've been in the negotiating room with Trump described his predictable tactics: "threaten the outrageous, ratchet up the tension, amplify it with tweets and taunts and then compromise on fairly conventional middle ground." Go deeper: How China's long-term thinking threatens the U.S.
China is considering ending its 4-decade-long policy of limiting the number of children families can have, reports Bloomberg. The big picture, from Axios' Michael Sykes: China's birth limits have left the country with an aging population, a shortage of working-age citizens, and millions more men than women — all as the country's birth rate has declined for decades. This would be China's second shift on the policy after Beijing permitted families to have two children in 2015. Go deeper: The world's fastest-shrinking countries ; When children become scarce. Burundi’s President Pierre Nkurunzizahas won a referendum that could see him remain in power through 2034, reports the AP, in a vote the opposition says was marred by voter intimidation. Axios' Stef Kight breaks it down: Asylum seekers wait an average of 19 months for a hearing in Canada, according to the Post. But the Canadian federal government recently decreased the wait time for work permits to just 3 weeks, and made it easier to move new immigrants to more rural parts of the country that have labor shortages. Italy's populist coalition-in-waiting has nominated Giuseppe Conte, a law professor with no political experience, to be the next prime minister. The markets have been rallying against Italian bonds in fear that the new government's policies will deepen Italy's fiscal crisis and harm relations with the European Union. Lava from Hawaii's volcanic eruption. Photo: Mario Tama/Getty Images. Sure, it's not world news. But holy cow. Plastic found in ocean's most remote spot. Merkel and Putin seek common ground. Shocking details from China's re-education camps for Muslims. Saudi Arabia arrests women's rights activists. U.S. cuts Syria stabilization funding. Ex-spy Sergei Skripal discharged from hospital. "I think if you try now to fold all those issues — ballistic missiles, Iran’s behavior, Iran’s disruptive activity in the region, nuclear activity — if you try to pull all of those into a new jumbo Iran negotiation … that seems to be what they envisage and I don’t see that being very easy to achieve in anything like a reasonable timescale." — U.K. Foreign Secretary Boris Johnson on Pompeo's "Plan B"